Why is the Belgian state structure so complicated? 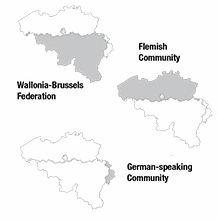 Belgium has two types of federated entities: Regions and Communities. That is why our state structure is so complicated. The country was divided into regions and communities because the Flemings and Walloons wanted a federal state for different reasons. Flemish citizens pursued cultural autonomy for all Dutch speakers, as well as for Flemish citizens living in Brussels. That is why three Communities were created: the Flemish Community, the French Community and the German-speaking Community. The word 'community' refers to the population group, which must be able to make decisions independently. The Walloons mainly wanted to pursue their own social-economic policy. For this reason, three Regions were created: the Flemish Region, the Brussels-Capital Region and the Walloon Region. The word 'region' refers to the territory. Belgium is divided into a Flemish, a French and a German-speaking Community. The Flemish Community comprises all the inhabitants of Flanders and Brussels-based Flemings. Brussels Flemings live in the bilingual Brussels-Capital Region and speak Dutch. The French Community comprises all the residents of Wallonia and French-speaking inhabitants of Brussels. The German-speaking Community comprises all the inhabitants of the nine German-speaking municipalities in the east of Belgium. Each community has its own legislative body, and its own government. The community governments and legislative bodies decide upon matters such as culture, education, language, health care, etc.. 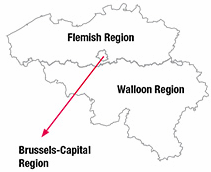 In addition, Belgium is divided into three Regions: the Flemish and Walloon Regions and the Brussels-Capital Region. The Flemish Region is made up of the territory of the five Flemish provinces. The Walloon Region encompasses the territory of the five Walloon provinces. There are also nine German-speaking municipalities in the Walloon Region. They do not constitute a German-speaking region. The Brussels-Capital Region encompasses the territory of the nineteen municipalities of Brussels. Each region has its own legislative body, and its own government. The regional governments and legislative bodies decide upon matters such as housing, economy, transportation, public works, the environment, spatial planning, energy, land use etc..
On the Flemish side, the Flemish community and the Flemish region were immediately combined into one Flemish federated entity, with one Flemish Parliament and one Flemish Government. This single government and parliament can decide on all matters in Flanders and on all matters pertaining to the Flemish community in Brussels.